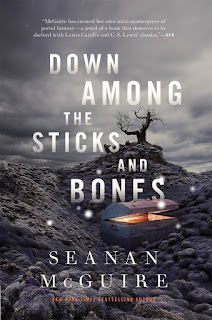 Seanan McGuire returns to her popular Wayward Children series with Down Among the Sticks and Bones―a truly standalone story suitable for adult and young adult readers of urban fantasy, and the follow-up to the Alex, Hugo, Nebula, and Locus Award-winning, World Fantasy Award finalist, Tiptree Honor List book Every Heart a Doorway. 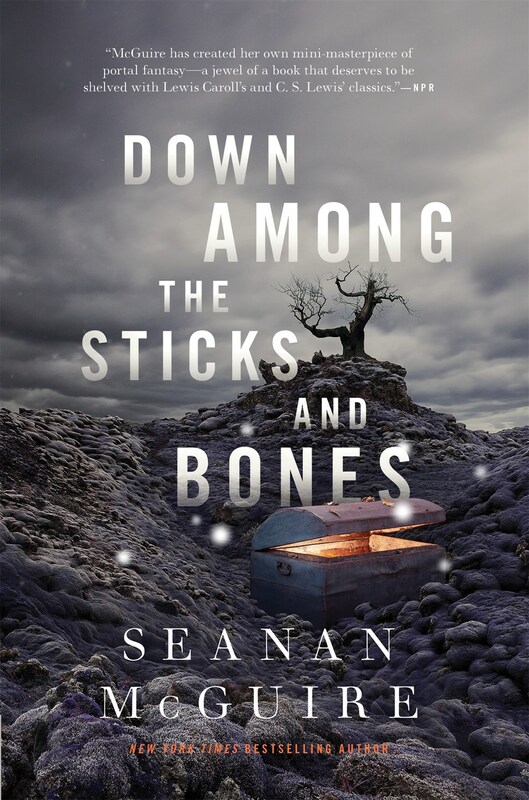 Down Among the Sticks and Bones, the remarkable follow-up to Seanan McGuire's Every Heart a Doorway, tells the story of twin sisters Jack & Jill, and how they found their door, and how they were forced back to the real world. Raised to fit the perfect ideals and preconceived notions of children that their parents have, Jacqueline and Jillian are never allowed to be children. They are told how to behave, how to dress, how to act, but never how to love or be loved. One day, the sisters decide to do something dangerous; they are going to break a rule and play in their grandmother's former room (Gemma Lou being the only person in their entire world who tried to encourage them to be individuals). They find an old steamer trunk in her room that contains costume jewelry and outfits for dress up, and underneath the clothes they find a stairwell in the trunk that shouldn't be there. Determined not to ruin their adventure, the sisters decide to follow the stairs down, their 12 year old minds not quite comprehending the impossibility of this event. At the bottom of the stairs they find a door, and that door holds a sign that reads, Be Sure. This door leads them to The Moors, a dark and sinister world of vampires and werewolves, mad scientists and other things that go bump in the night. Here, the sisters discover their true selves. Here, they also discover that they have choices, and those choices eventually come with consequences. Most portal fantasies always have a darker tone under their magic and whimsy, but on The Moors, all the magic and whimsy is stripped away to reveal just how dangerous and stark some worlds can be. Brutal and fierce, this book is the perfect follow up/companion to Every Heart a Doorway. Here is a handy outline of all the portal worlds discovered so far in the series. Some possible spoilers as this list is up to date with the most recent book. The books follow an every other pattern, one book set in the "now" at the school, the next telling a portal world story about one of the students, then back to the school.